Don Ella Marie Dailey Reed was born on August 7, 1927 to David Leroy and Gertrude Edna (Davis) Dailey, the ninth of eleven children in the family. 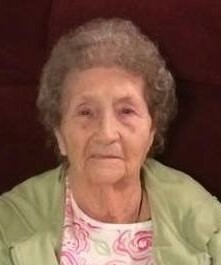 She left this earth on March 25, 2019 at the age of 91, living a long and happy life. Don Ella graduated from Mount Ayr High School in 1945. On June 1, 1946, she married Kenneth Reed and they established their home in rural Ellston. To this union five children were born: Phyllis Ann, Allan Dean, Alyce Kay, Lisa Jane, and Debra Jo. They enjoyed life on the farm south of Tingley until their retirement in 1991, moving to Mount Ayr and building a home on her parents’ lot. For many years, they opened their home to friends and family on Fridays for lunch and fellowship. Don Ella enjoyed bon fires & wiener roasts on the farm, laughing, playing cards, cooking and always family get-togethers. Don Ella was an avid St. Louis Cardinals fan. As long as her health permitted, she volunteered at the Neighborhood Center forming lasting friendships. Her church was very important to her and brought her great joy. She was a member of the Presbyterian Church in Tingley, later transferring to the United Baptist Presbyterian Church in Mount Ayr. She spent her entire life in Ringgold County. Those preceding her in death are her parents; husband Kenneth in 1996; brothers Harold, Jack, Howard, Frank, and Merle; sisters Darlene Harvey, Margaret Rhodes and Dorothy Taylor; brother-in-law Joe Don Reed. She leaves behind her children Phyllis (Russ) Brandes of Hancock, IA, Allan (Linda) Reed of Spickard, MO, Alyce (Ed) Mattis of West Des Moines, IA, Lisa Jackson of Ellston, IA, and Debra (Bill) Dodge of Des Moines, IA; grandchildren Arianna (Mike) Graham, William Dodge II, Darcy (Frank) Hines, David, Jennifer and Michael Dodge; great grandsons Colby and Caden Hines; brother Donald “Jake” Dailey; sister Jo Parker; sister-in-law Gloria Reed; two special nieces, who spent many summers on the farm, JoKaye Shields and Karen Clark; special friends Leonard and Charlotte Swank; and many nieces, nephews and friends. Memorials are to the Ringgold County Public Health and the Family Resource Center.